What a great interview! Thanks for hosting Barney and giving readers a peek into his creative life. My oops isn't necessarily the best example, but what came to mind were the many times, as an elementary teacher, I've had think on the spot and turn around an unexpected glitch and/or "oops" in a lesson and make it a "teachable moment." Often those "oops" moments turn out to be the most memorable. Oops! My email address is diannewrites at gmail dot com . Dian--yes, "teachable moments"--I finally figured out that that's really what LIFE is all about, right? Sometimes I'll turn to my students and ask them how to do something I've just messed up. And Linda--another life lesson: showing up--we'll figure out how to do it another way. Um - I guess I forgot the "how you or someone else turned it into something beautiful" part (see, I "oops" all the time!)... Well, the kids were willing to let the presentation move on, and forgiveness is a beautiful thing! Truly a beautiful interview. I love how poets visit schools and share their passion for painting through verses in schools - I feel that music and poetry are largely marginalized. Kids also often have the misconception that poetry is boring or difficult. It's lovely to see images such as this. Hi April! I enjoyed reading this post, and you introduced me to a new author at the same time. It's so exciting when a blog I discover teaches me something new. 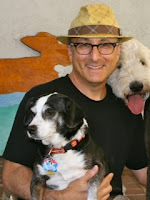 Thanks for sharing this inspiring interview with Barney Saltzberg. Now off to check out some of his picture books. What a delight! 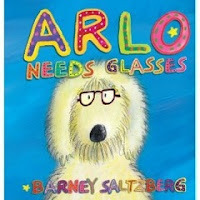 I love this book and am so happy to know where to find Barney in the print and internet world. Thank you for this post! As for an OOPS, mine may be about cats. Cats find us here in the country, and each time we think, "Oh, no...not a one-eyed cat" or "Oh no, not a feral" - and then we fall in love again! I have this book, so no need to enter me in the giveaway. I want someone else to own it too. At a book signing, I messed up on a kid's name. Lucky for me, I figured out how to turn those messed up letters into an on-the-spot doodle of a chicken. OOH. I really like that poem! Fabulous story about how you first got published, Barney! "Breaking the rules" in style!! Such a great perspective to share with kids! I look forward to seeing this book. As for my own oops, I embroidered and rejected a number of wild animals for a cross stitch pattern booklet. The darn caribou antlers were harder than you might think, and the grizzly background kept changing. In the end, I had enough animal rejects to make a nine-square pillow that became a very nice gift for my mother. Thanks for the great interview - I love reading about process and inspiration. In high school my PB&J sandwiches would often get flattened or mashed under the rest of my lunch. One day I looked at my partially mushy, squashy, jelly-soaked meal and decided to finish the job. I grabbed the plastic bag and kneeded it between my fingers... I swung it around my head and whacked it repeatedly on the table. In the end I had a perfectly spherical, firm, moist "Peanut Butter and Jelly Ball." And it tasted amazing. Henceforth, for the rest of my highschool career, I intentionally created Peanut Butter and Jelly Balls at every lunchtime. It drew quite a bit of attention. And actually, I continue to make them to this day for my kids. They often ask for them, so we pull out the plastic bags and smash ourselves a treat. My 'oops': Telling my first year students that they could turn in their weekly composition essays one day late if they also brought me a cup of coffee with their papers. I received only 25% of the papers on time. The following day received 9 papers and 9 cups of coffee. The upside? Learned that offering 8 cups of coffee to colleagues would create 8 opportunities to laugh and learn how to be a more effective teacher! Oh, goodness. What oops to talk about. I seem to make them all the time and children are not usually shy about pointing out to me. I know one area that I make oops all the time is consistency in class management. Sigh. I can only keep trying. Great interview! 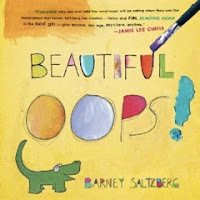 I just bought BEAUTIFUL OOPS for my niece, but I haven't mailed it yet, because I really want to keep it for myself! Tammie—I've done that, autographed the wrong name or the wrong spelling—and then cartooned it away. Once when I wrote “Judy” instead of “Judi,” I asked if there was another Judy in line for an autograph...and—hallelujah—there was! And Jen—that pillow sounds wonderful. I stitch together rejected lines of poetry sometimes...and though mostly they are not so great, sometimes they are. Z-Dad...wow, a peanut butter and jelly ball? Kids'll love that, no doubt about it. It's slightly weird...but art is so subjective. Cathy—nice that you shared the coffee with your colleagues. Probably better than being a super-caffeinated teacher! I didn't comment on everyone's comment, but thanks to ALL who have shared your Beautiful Oops!